…is a company made up of five separate business units, which together offer a comprehensive range of services to the mechanical engineering industry. Our focus is on the manufacture of medium weight and heavy engineering products. Our strength as a supplier lies in our ability to handle turnkey projects, ranging from serial production or customized batches to single production. In addition to the manufacture of components, our services include mechanical and electrical assembly, as well as hydraulic installations. To complete the package, our products come with functional testing, trial runs and, if required, on site installation. This link provides a bit of history for the company. A press release from 2012 regarding a new investment mentions a few of its bigger global clients, which include General Electric, Siemens and Atlas Copco. The website of the company gives a picture of a very all-round supplier, which provides a complete package of both manufacturing and services. This link provides (partially in Finnish) a list of processes and industries they have expertise in. From the profile of this company it is clear that it is a typical provider of high-skilled jobs (in both manufacturing and services) and it is very sad that the company is downsizing so much. The writing has been on the wall though. 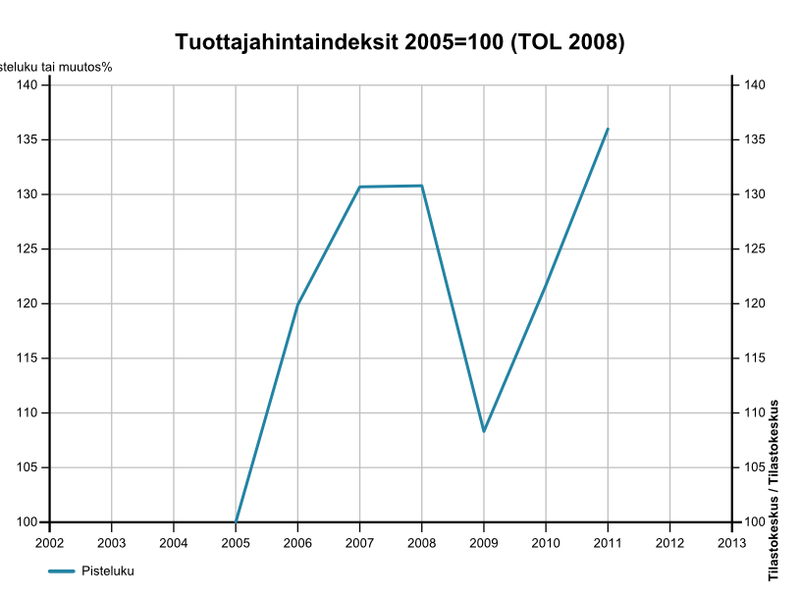 The Finnish newspaper Kauppalehti has published since 2009 some news on the company in relation to its results. In 2009, its turnover declined significantly, but regardless of that (in the words of the newspaper) its ‘result’ (profit?) increased by some 63%. In 2010, its turnover was nearly half of 2009, i.e. a drastic reduction. The result for 2010 turned into a net loss, but the so-called gearing ratio was satisfactory still. 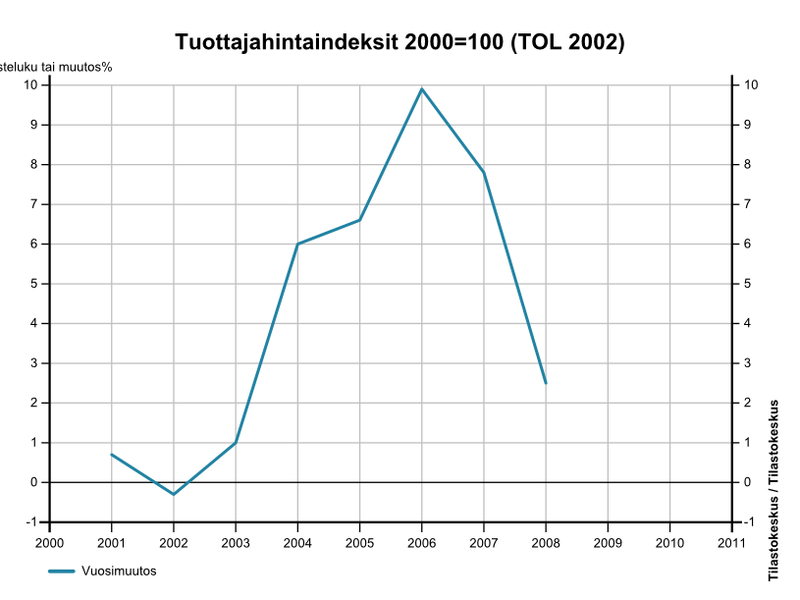 In 2011 turnover declined only slightly but losses increased by some 80% according to the press release. The results for 2012 are behind a paywall, but earlier this year the co-decision negotiations were initiated, where it was said that the Loviisa unit (which had the investments) was outside the scope of these negotiations. So, apart from the ‘obvious’ drop in 2008-2009, producer prices have increased, although they are currently nearly flat and declining slightly. For all the talk about high wage costs in Finland (which in terms of Real Unit Labour Costs are worrying in that they are higher than Germany’s), this is one thing we should talk about in terms of competitiveness – companies set the prices for their products and services, and that is what customers see. Producers may set higher prices because of higher costs (and certain profit targets) but higher prices mean lower turnover when demand is weak. And then, inside the company, the balance of costs becomes important, which useally (in industry certainly) leads to cutting costs where it is easiest: personnel. In a case like Hollming’s it is very difficult to say what is the exact source of the lack of competitiveness. Most likely it is a combination of all factors together – demand, rising producer prices, relative share of wage costs, exchange rates. And it is entirely possible that Hollming is very competitive in terms of services and the quality of its products, but exchange rate issues suffocate the company. And no, I don’t think the current Employment and Growth agreement will do much for this kind of company. Beyond these general issues regarding competitiveness I think it is a bad sign that such an all-round company, which is able to operate in many industries, is in trouble. I hope this is not the ‘canary in the mine’ but I do wonder about the situation in similar companies that are supplier to other industries. This is the industry sector Finland has been very strong in, and it is not quite encouraging that there is not enough demand (in Finland/Europe/worldwide) for this kind of company to operate successfully. Time will tell. This entry was posted in Economy, Eurocrisis, Finland, Industrial Relations and tagged competitiveness, exchange rate, Hollming Works, producer prices, Redundancies. Bookmark the permalink.